The Age and The Australian Financial Review journalist Adele Ferguson took out the big award at Melbourne Press Club’s Quill Awards on Friday night. She was awarded the Graham Perkin Australian Journalist of the Year for 2015 and the Gold Quill for an expose of systemic wage fraud across the national 7-Eleven retail chain. Ferguson becomes the first journalist to win consecutive Gold Quills. She won the 2014 Gold Quill for her expose, with ABC Four Corners colleagues, of the financial advice sacandal of the Commonwealth Bank. The Gold Quill carries a $7500 prize. 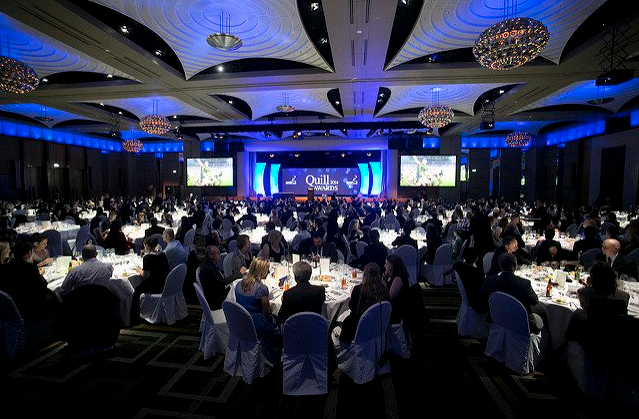 It is supported by the Melbourne Press Club’s Principal Sponsors Monash University and Virgin Australia. Meanwhile, journalist Gerard Whateley won the inaugural Harry Gordon Australian Sports Journalist of the Year Award for his interviews and in-depth reporting of AFL’s biggest scandals. Adele Ferguson’s expose of systemic corruption and abuse across the national 7-Eleven retail empire was an outstanding feat of investigative journalism. It triggered the resignation of 7-Eleven’s Australian founder and chairman, Russ Withers, high-level inquiries and big compensation payouts. The story was especially compelling because it revealed the wholesale exploitation of some of the most vulnerable migrant workers in Australia. It gave voice to voiceless. The judges were deeply impressed by Ferguson’s forensic investigative techniques, her determination to see justice done and her powerfully dispassionate reporting style. Adele Ferguson holds the torch to the belly of the big end of town. Her fearless accounting of financial malpractice delivers us journalism equal to the power of the regulators she often leads to the scene of the crime. In a series of exclusive stories she unpicked complex transactions and highly technical documents to expose wages fraud at Australia’s biggest convenience chain 7-Eleven, serious misconduct within NAB’s financial planning arm and insider trading in one of the nation’s biggest wealth management companies, IOOF. Heads rolled in these institutions as authorities responded with Senate hearings and further investigation by the Australian Securities and Investments Commission while those disadvantaged by corporate deceits were given avenues for redress through compensation schemes established as a result of Ferguson’s rigour. Gerard Whateley sets agendas. His work across radio, television and print has a no-nonsense directness about it that treats the audience with respect. His entry showed journalistic versatility combined with a knowledge and understanding of a wide range of sport. He can move comfortably from a forensic and combative interview to the color and enthusiasm of calling a Melbourne Cup or a cricket Test. His television interviewing can be penetrating. His questioning of James Hird showed a confident grasp of complex detail. His analytical assessment of the booing of Adam Goodes was fresh and uncomplicated. In interviews and analysis Whateley does not take a backward step but he works with dignity and resists the temptation to hector. His enthusiasm for the theatre of sport is obvious in his live calling while his passion for sport and interest in its participants shines in all his work. He is both incisive and eloquent, a genuine all-rounder. Journalism can take heart that the next generation of industry leaders is ready to accept the challenges of our times. Entries in the Young Journalist of the Year demonstrated flexibility, multi-skilling, clever use of social media and innovation. One entrant developed a piece of software to create a tool that produced a good story by synthesizing data bases. CITATION FOR WINNER Tom’s persistence and contacts exposed the identity and backgrounds of Islamic State supporters in Melbourne, including those with links to the men accused of plotting the Anzac Day bombing. Tom also secured the vision of Bill Shorten using his phone while driving and wrote an impressive narrative of the Christmas Day bushfires. Breaking news coverage of the Wyndham Lake tragedy and his help with a Herald Sun campaign for swimming lessons in schools completed a distinctive portfolio. A solid piece of current affairs journalism on the mishandling of asbestos disposal at the Bulla Tip. Reid’s story prompted the Environmental Protection Authority to examine asbestos disposal practices at other sites, as well as an examination of the EPA’s own procedures. Annika Smethurt’s explosive story on Bronwyn Bishop’s use of a taxpayer-funded helicopter to attend a Liberal Party fundraiser in Geelong had enormous implications for national politics. It led to the removal of Ms Bishop as Speaker and had a decisive effect in bringing about Tony Abbott’s demise as Prime Minister. Annika demonstrated persistence in pursuing the story both in print and online as new details emerged. It is a fine example of print journalism. Julia Medew’s story was the result of dogged investigation utilising background knowledge and contacts she had developed as a Health Reporter. The story forced the government to dump it’s co-payment policy due to an intense public reaction. The backflip was the beginning of the end for Tony Abbott’s Prime Ministership. Margaret Simons has produced a well-researched and compelling piece of long form journalism underpinned by a strong sense of law and justice, and social responsibility. The story highlights the exploitative behaviour of men in a vulnerable society, and questions the role of Australian agencies in holding such men to account. The 7-Eleven exposé by Adele Ferguson, Klaus Toft and Sarah Danckert, stands out as exceptional in a strong field of nominees. It has the lot: a billion dollar private company, a global brand, whistleblowers, undercover surveillance, explosive documents. The story is told deftly across multiple platforms and it continues to unfold. A powerful investigation the ABC’s Josie Taylor and Alison Branley, these stories reveal systemic exploitation, and alarming practices in the vocational education sector. Waleed Aly’s columns stand up off the page and argue his case powerfully, as if in person. His writing takes you by the shoulders and shakes you. His analysis is clear-eyed and his logic effortless. Waleed is a deep thinker who dismantled the cynical but prevailing arguments on deaths at sea with a clarity that punctured hypocrisies with the sharpest of insights. Jacqueline’s coverage of this tragic breaking story ticked all the boxes, exclusive footage of the failed attempt to rescue four children trapped in a car, the first interviews from the scene,and an accurate account of the event all done under intense deadline pressure. The value of her rep.ort was underlined by the fact Victoria Police used her vision to help investigate the incident. The judges said this was a great example of a team coverage of a complex and rapidly breaking story. The Leader campaign across 33 mastheads, dubbed #Keep70, persuaded the Victorian Government to abandon a bureaucratic decision to automatically reduce the 70kph speed limit on almost 2000 roads across Victoria. The Leader journalists who had campaigned for the change then reported the back down on the front page of the Herald Sun. This exclusive story revealed the full range of tactics used by Melbourne rail operator Metro to hit its punctuality and reliability targets and win lucrative performance bonuses from the government. Carey’s thorough and detailed reporting provided commuters with a rare insight into the issues around their daily commute. Lamperd’s inspirational, compelling and brilliantly-presented account of football legend Neale Daniher’s battle with Motor Neurone Disease, powerfully demonstrated the reality of how disability can randomly strike even the fittest among us. The judges were deeply impressed by her skill in winning the trust of Daniher and his family over many months and in distilling that work in a brilliant, long-form multi-media package. 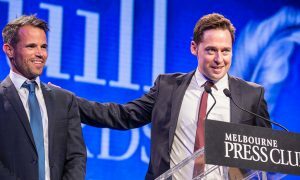 The Herald Sun campaign built on the story raised more than $1 million for MND research – an example of journalism at its best. A thorough and well-researched report on the systemic problem of younger disabled patients being forced to accept accommodation in aged care facilities – a crisis that won’t be easily resolved by the National Disability Insurance Scheme. 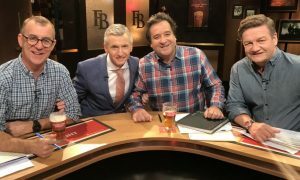 This trio gained exclusive access to 1294 revealing pages of transcripts from the secretive 17-day AFL Anti-Doping Tribunal hearings in the case against 34 Essendon players. An eight-page investigation was published in print and all 1294 pages went online in an interactive expose that included bombshell stories about the physical effects of supplements on players, the Bombers’ supplements schedule and that Stephen Dank also sourced drugs for Geelong. A genuine scoop. Patrick Bartley is fearless in exposing some of the darker issues affecting racing. Just hours after shots were fired into the front door of chief steward Terry Bailey’s home, Bartley spoke to and reported exclusively on what had happened to Bailey and the fact he was still unrepentant in his drive to make Victorian racing drug free. When Phil Walsh revealed to Mark Robinson that his all-consuming passion for football meant he had disconnected with his son, no one realised how prophetic his words would be. Walsh admitted he had not been a good father in the past but was desperate to be there for his boy in the future. When Walsh was murdered and his son Cy charged, Robinson’s interview and accompanying first-person feature gave a rare insight into the troubled relationship and Phil Walsh the man. Dan Menzel gave one season of promise for AFL team Geelong, before he ruptured his ACL in September 2011. By August 2013, he had ruptured his ACL 3 more times and had undergone 4 knee reconstructions. This hour-long feature documentary, shot over three years as a personal video diary, offers a unique and intimate insight into the pain and turmoil experienced by a professional athlete away from the bright lights of game day. This campaign – which investigated the gender divide in sporting facilities available to girls in suburban Melbourne and particularly the Bayside area – was a classic grassroots campaign for this paper. It identified a community issue, raised its profile and ultimately, affected worthwhile change. The judges were particularly impressed with the journalists’ ability to convince a council to provide self-incriminating data which was a critical part of this campaign. The reporters unearthed an issue of great relevance to the local community and digital executions added depth and interest to the campaign. This campaign demonstrates how a suburban newspaper is an integral part of the fabric of of a community and can prompt change within the community. This entry showed a real commitment to a story – the journalist was tenacious and dogged in her approach, creatively taking steps to force the police into action. The investigative work involved took a real-life community concern and put it squarely on the “local” agenda, revealing the extent of the problem locally. Great line, great idea, with his simple timeless image about ‘lifestyle choices’, Andrew Dyson speaks for the nation. Mark Knight ticks all the boxes of a good cartoon, humor, draughtsmanship, and caricature. He illustrates the relationship between the former Prime Minister and his Chief of Staff Peta Credlin perfectly. All three headlines used word plays that worked on several levels. ‘The Elephant in the Womb’ works on many levels: pregnancy, US abortion debate, Republican party symbol and sounds good if read out aloud. The headline ‘Love will tear us apart’ is a clever deployment of a popular song title to characterise how an issue that refused to fade into the background was paralysing the government. The judges felt this entry was of an international standard. The artist illustrates a clear message about the imminent destruction of our planet by climate change, and challenges the delegates of the Paris Summit to clear the air. The strong use of colour and graphic elements are integrated with excellent typography to create this winning work. This is a true multi-platform, multimedia offering on this important investigative story. No matter how much you read about the Seven-Eleven investigation, you could learn more by accessing this online version, with its effective use of video, original documentation, text and photography. This impressive entry had at its heart the effective use of the online medium to seek out and determine the concerns of the audience, and allow them to guide the journalism on a complex issue. The judges would like to see more of this kind of work. Bronwyn Bishop’s helicopter ride became a defining moment for Tony Abbott’s reign as Prime Minister, and the effects are still being felt today. Annika Smethurst and Rob Harris’s story came out of a forensic trawl of MPs’ expense claims. Despite official denial and obfuscation they broke several stories over the next fortnight, in particular making clever use of the Herald Sun’s digital platforms to exclusively reveal a picture of Mrs Bishop’s helicopter. Their relentless pressure finally told when Ms Bishop, one of Mr Abbott’s closest allies, was forced to resign. Mandy Squires’ series into bullying at Geelong City Hall started with revelations a psychologist was treating council employees, and ended nearly a year later with the State Government announcing an inquiry into the troubled council. Operating in a small newsroom, her impressive body of work constantly broke new ground and was highlighted by some innovative digital ideas. She was subjected to bullying and threats herself, but she never let up. Cam’s dogged pursuit of hit-run killer Puneet Puneet led to a genuine exclusive that had been sought after by all TV networks for many years. Pictures of the fugitive in medical mask and with his parents were compelling, and it was the first time we’d heard from Puneet since he fled Australia. Kate’s quick-thinking to capture a brawl inside the Magistrates Court, follow the story through lengthy legal machinations and fight to get it to air gave viewers a glimpse of a place never seen on television before. Using a powerful and innovative style of storytelling, Tom Whitty and WaleedAly’s editorial feature captured national and international attention, during a time of saturation coverage following the Paris attacks. Highly researched, well written and passionately delivered, this piece helped audiences contextualise the arguments around ISIL and their tactics. The relevance and impact of this video was measured by in its staggering online reach – almost 160 million views to date. True Detectives is the culmination of years of dogged investigative reporting by Nick McKenzie and Richard Baker into Victoria’s gangland killings. With outstanding production by Klaus Toft, this report exposed corruption within Victoria Police and uncovered serious failings in its witness protection program. Baker and Mckenizie convinced George Williams and former police detectives to speak on camera, and used tasteful high impact re-enactments to detail the relationships between the criminal underworld and senior police detectives. The program also revealed one of Carl Williams cellmates at Barwon Prison had an association with former detective Paul Dale. This was a story of significant national interest which took years of persistence to tell. Belinda Hawkins earned the trust of one of Australia’s most media shy families, exploring their struggles with the attention that came with the Bradman name. It was an intimate look which revealed surprising elements of a well known family, focusing Greta Bradman’s private battle with depression and suicide. Cooper’s three outstanding reports on separate shocking fatal road accidents – including the death of Cooper Ratten in the Yarra Valley – sent a strong message about a range of random dangers on our roads. Each was an example of first-class television reporting – tight, thorough and well-edited with every angle covered. The judges applauded Cooper’s skill in reporting each tragedy with compassion, professionalism and an absence of cliche. A ground-breaking and well-written news report and feature article that demonstrated the extent to which accidents rather than negligent or reckless behaviour are a major factor in most Victorian road fatalities. Lauren used her journalistic nous to break new ground in her coverage of a public sector pay dispute – putting in hours of legwork, sifting through hundreds of pages of documents. She revealed that striking train and tram drivers demanding an 18 per cent pay rise had already received a 28 per cent increase over the previous six years. Lauren went beyond the obvious – dug deep – and delivered on an angle no-one had covered. Yvette’s report on a breaking news story went well beyond the bare facts available from police. She used her contacts to gain more information on the murder of a schoolgirl which had shocked the city – while remaining sensitive in her reporting and never straying into sensationalism. The report exposed a serious administrative problem effecting thousands of motorists – forcing an admission of fault by the state authority. VicRoads apologised, agreed to pay back hundreds of thousands of dollars in fines and withdraw demerit points. An external auditor was appointed to deal with a litany of systemic problems exposed. The report stemmed from a dogged investigation of a complaint by a single caller to the program – and was an example of radio current affairs at its best. Mitchell obtained an apology from the alternative prime minister after exposing his misleading account of his role in the Labor leadership struggle. Bill Shorten later admitted to Mitchell he had ‘no alternative but to lie’. A powerful insight into the unique contribution to the community of women in the police force, their traditional role at the front line dealing with grief, victims of abuse and tragedy, and the impact of the work on their lives. Bridget operated under deadline pressures, turning her story around to incorporate the suicide of a female force member. The mental and emotional trauma experienced by women police officers who have traditionally dealt with some of the most graphic crime scenes, and often received little support or counseling. This was a compelling and confronting investigation that continues to have far reaching consequences for the greyhound racing industry. Provided access to horrific covert footage, the team demonstrated extraordinary investigate skills and determination. This story came close to winning the award. It is a wonderful example of determined and empathetic investigative reporting that resulted in the solving of thirty-year-old murder case. This is an investigation of the ice drug epidemic told in gripping words and detail. The series conveys the devastation and helplessness around a social problem with destructive tentacles deep into the community. The Addy also makes a bold bid for solutions, in the best tradition of regional media with uniquely local presence. Will’s exclusive shot was due to his intuition and years of experience. He sensed that something was about to happen, and was the only cameraman to capture the shot – not only pin-sharp but framed perfectly – that went all around the world. Cameron’s vision of the man police had been hunting for over the callous hit-run of an elderly cyclist was a genuine exclusive. A perfect example of the difficult work at being in the volatile environment outside court. When 11-year-old autistic boy Luke Shembrook was found alive in rugged bushland after being missing for more than 4 days, everyone believed a miracle had taken place. Here the photographer has captured the tender, heartfelt moment when Luke’s mother is reunited with her son. It was a moment all of Victoria had been hoping and praying for. This photo at a Reclaim Australia protest in Melbourne captures the moment a protestor and policeman share a clasped handshake. It was an image that went viral because it transcends the politics and polarisation so evident elsewhere on the day. JUDGES: When Michelle Payne became the first woman to win the Melbourne Cup she was instantly swamped by well-wishers and the media. Here Colleen Petch captures an historic moment after Michelle found a quiet place to sit down on her own and reflect on exactly what she had just achieved. JUDGES: A beautifully framed, touching and iconic image of history-making Melbourne Cup winner Michelle Payne with her strapper brother Stevie. It graced the front pages of several newspapers around Australia and was published across the world. In this portrait, the photographer has connected the audience with actor David Gulpilil in a remarkable way. Gulpilil’s face carries the pain he feels over injustices shown to his people as he talked about his latest film. The image is captivating. Homeless woman ‘Alicia’ is pictured in this very Melbourne picture studying in her tent beneath a city bridge where she has lived for many months, while struggling to complete Year 11 at RMIT. This image enhanced the story exponentially.